Over Forty years in the making, China is almost ready to share with the world the greatest Zoo ever conceived. The Great Zoo of China isn't just bigger and better though, it's unique - inhabited by creatures considered the stuff of legends - Dragons. A select group of VIPs and Journalists are invited to be let in one the worlds best kept secret and be shown these magnificent beasts. A big Zoo filled with dangerous animals and a small group of outsiders, what can possibly go wrong? Before I get really started on the review itself I'm just going to address the Elephant (or in this case Dinosaur) in the room, the inevitable comparisons to Jurassic Park. Yes The Great Zoo of China is essentially Jurassic Park with Dragons. No it's not (really) derivative. I love Michael Crichtons' novel (less so the films) and The Great Zoo does pay homage to that classic in it's own way. There is even a mention of the book (look out for a line from the film too) and how they are aware of the dangers inherent in such a project that feature ferocious beasts with sharp, pointy teeth. There are parallels - they both share that "Thriller" style of writing including the heightened levels of tension and energetic pace but they are also quite different in many ways. Regardless the line "Jurassic Park with Dragons" is a close enough to provide a loose description. The book begins with some plausible enough reasons for the Dragons to exist, I love the way the author ties this into the various mythologies that have cropped up in different cultures over the ages regarding these scaled beasts (very clever). After this brief intro and a bit of back-story things start to go pear-shaped and deteriorate rapidly. Once the danger begins the pace is pretty much relentless and entirely engaging. Lots of action and danger and death and destruction and explosions and general hijinks of that nature. The protagonist makes a great hero - at times coming across as a female version of John McClane with resourcefulness and general unwillingness to lie down and die. At it's heart it is pure escapism, a thriller that doesn't need to be taken too seriously. The only thing that I didn't really like about the book was the methods used to incarcerate the animals and to prevent them killing the soft, squidgy humans. While I appreciate that if they had used a foolproof idea we'd have a pretty boring novel, it also annoys me that one minute they are explaining they have seen and understood Jurassic Park and the next they totally undermine that sentence with the way they handle the Dragons. The author has clearly done some research on Chinese culture and it shows, he writes at the beginning of the book that China doesn't just want to be the biggest nation, it wants to be the most influential. And China doesn't just want to influence economy but like America it wants to influence society and culture on a worldwide scale. It makes a great deal of sense that China would create such a Zoo to further this ideal, and I can imagine they'd build it a lot like the author suggests too. The author creates like-able characters while the action scenes are on a par with the greatest action movies on the big screen. It is a book that would make a great film. 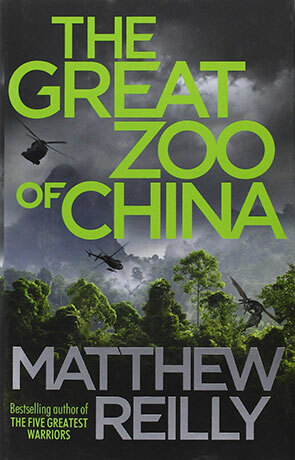 I enjoyed The Great Zoo of China from start to finish and found it difficult to put down. It's fun, it's tense, action-packed and rewarding with a subtle humour that offsets all the action and bloodletting. A Hollywood Blockbuster in Book form. Written on 19th January 2015 by Ant.